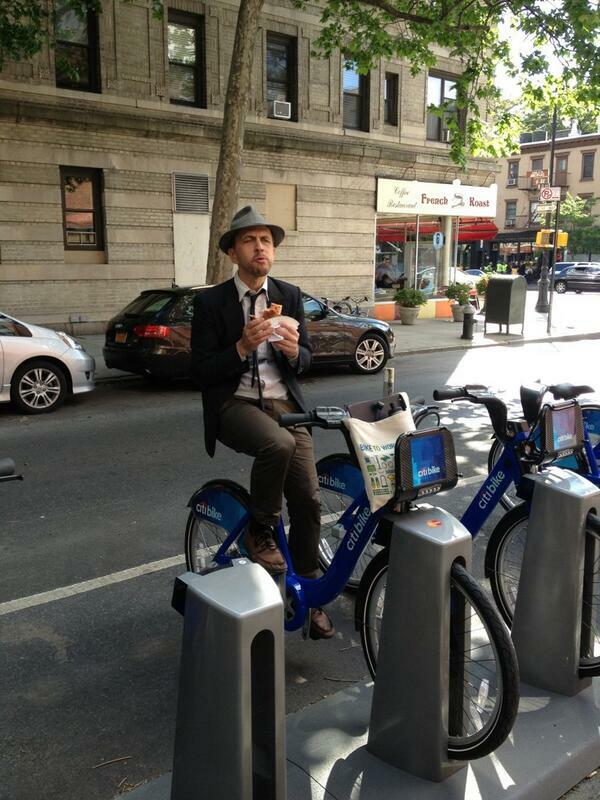 The author enjoying a docked Citibike. When Citibike debuted in NYC in May of this year I happened to be visiting while on tour with a choir I sing in. As a pro-bicycle, three-year car-free San Franciscan I was giddy about the Citibike launch, I even posed for a photo on one out of sheer exuberance on the day before they were made available. The Citibike launch is now history and the prediction of the streets of NYC running with the blood of neophyte bikers turned out to be overblown but one impression from that weekend has stayed with me: two of my friends there, both life-long New Yorkers, one progressive, one conservative, agreed: they hated Citibike. The conservative friend parroted the Murdoch papers’ complaints: it will be a bloodbath, old ladies will be knocked over willy-nilly, cyclists are lawless, non-taxpaying “hipsters” and clueless liberals heedless to the safety of themselves and others. The progressive friend, equally scornful, rattled off the progressive objections; Citibank is the Great Satan; why are we plastering our city with ads to these robber barons? Why is this program confined to wealthy white neighborhoods? These positions illustrate the extreme political poles of the urbanism debate Jason Henderson so brilliantly frames in his great book, Street Fight: The Politics of Mobility in San Francisco. The middle position or “third way “ not depicted in my representation of the Citibike debate is the neo-liberal position (pro-Citibike), with which I think most self-described urbanists would identify. David Edmondson [ed. – founder of this blog] is an example. It’s doubtful conservatives in the US can be won over to some of the core tenants of urbanism. Automobility is a defining characteristic of American conservatism. Fears of Agenda 21 and “one world government,” hostility towards the nanny state, and climate change skepticism make urbanism anathema to even mainstream conservatives. Progressives however, can and should be persuaded to support urbanism’s goals. While progressives and urbanists often clash, recently and most visibly in the Bay Area over the question of gentrification (the Google Bus phenomenon) and labor issues (the BART strike), I believe these two groups have much more in common than they have in conflict. Progressives and urbanists are united over the urgency of climate change and environmental degradation. In general, progressives and urbanists can agree on the need for revitalized cities as a solution, but they often part company with how to get there. Neo-liberal urbanists offer market solutions to these problems, and view “livability” as an urban quality best viewed as a commodity. Progressives stress state solutions and social justice as integral to the project of urbanism. Many progressives perceive “livability” as synonymous with gentrification. These progressives see parklets, bike lanes, bike share and events like Sunday Streets in San Francisco as part of an insidious march towards a city of privilege, for the rich only. I have even encountered progressives who defend access to cheap parking and automobility for the poor and working classes as a social justice issue. Stop focusing your support on high-end development and be more sensitive to the problems caused by gentrification. Gentrification reduces economic and class diversity and decreases a city’s cultural capital by displacing the creative class that makes the city attractive to begin with. As well, it displaces the poor and working class folks who are the perfect constituency for public transit. These people end up moving to the outer urban core and contribute to increased automobility as a result. Likewise, high-income folks are generally wedded to automobility, their injection into the urban fabric in parking intensive developments increases automobility in the city. The optics of luxury developments, like San Francisco’s 8 Washington, further drive a wedge between progressives and urbanists. Urbanists are part of a professional class (architects, planners) who are by their nature and training data-driven thinkers. This fact blinds urbanists to the importance and validity of emotional responses to the use of urban space. Nothing could be more emotional in some ways than an individual’s identification with the place they live. Urbanists should be wary of their own predilection to dismiss and belittle emotional reactions to development and gentrification particularly when they enter the political realm (as through Proposition B, which would approve 8 Washington) to further their goals. Livability is not gentrification, and anti-growth is not anti-gentrification. Improvements to livability in the public space benefit all classes. Stop singling out parklets and bike lanes as evil, and learn to support increased density near transit. Dense development will increase housing stock and drive down displacement, reducing dependence on automobility among the poor and working class by providing a more robust (and yes, partially higher-end) constituency for public transit. Acknowledge that dense development is inevitable, and that some of it will be luxury. As Edmondson has written before, luxury developments can and do take pressure off the housing market by shifting demand from existing “low-end” housing stock, thereby easing the market and slowing displacement. Opposition to automobility should be a progressive social justice issue. The primacy of cars in the city places undue strain on poor and working class folks. It clogs our streets and slows public transit. A bifurcated, inequitable system, where the poor depend on transit slowed and made unreliable by the rich driving around them, is the result. The costs of car ownership – insurance, maintenance, and parking fines – are all borne disproportionately by working folks. Freeing them from automobility will engender increased social mobility. Poor and working class neighborhoods near freeways and high-traffic city streets disproportionately suffer the worst health effects of automobility’s pollution. High rates of cancer and respiratory problems are the result. Globally, the effects of climate change brought about largely by car- and carbon-intensive cities will hit the world’s poor hardest. Mostly, let’s all break free of the zero-sum tenor of internet discourse. Stop yelling past one another and listen. If we agree to do that, progressives and urbanists working together can achieve the common goal of sustainable cities. The time to make history is now. Let’s be the change we want to see.